1. Put half the blueberries in a small saucepan with the sugar and 1 tbsp water. Heat gently, stirring frequently until the blueberry juices start to run. Stir in the remaining blueberries, transfer to a bowl and leave to cool slightly. 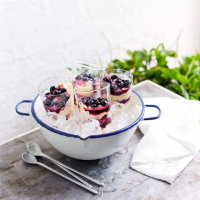 2.Stir the lemon curd into the crème fraîche and divide half among 4 small dessert glasses. Spoon half the blueberries on top and add a scoop of vanilla ice cream. Spoon all but a couple of tablespoons of the blueberries on top and then the rest of the lemon curd mixture. Top with the reserved blueberries. Serve immediately. This recipe was first published in Wed May 28 11:16:27 BST 2014.